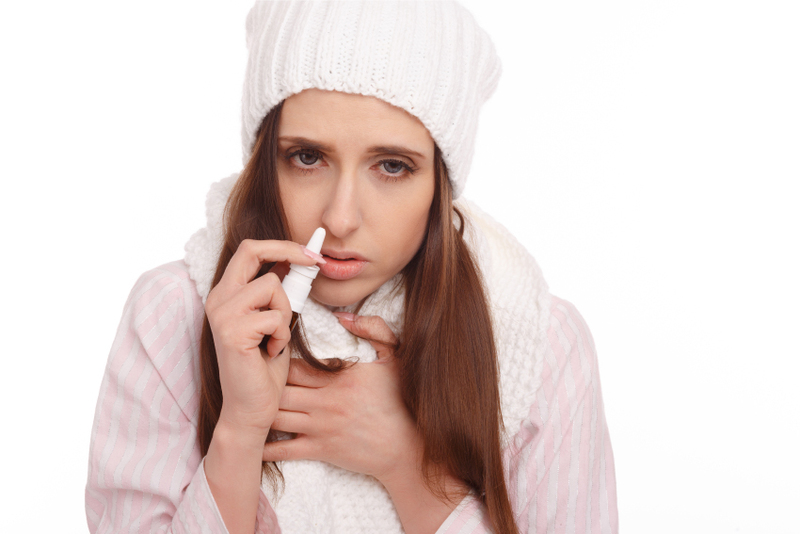 Decongestants, Saline Nasal Sprays, Or Steroids: What To Use When Suffering From Cold Or Flu? A nasal spray is a medicine that you spray into your nose. There are three different types of nasal sprays decongestants, saline nasal sprays, and steroid nasal sprays. How do these nasal sprays help you and what type is for you? Nasal sprays can really help you out if you’re suffering from a stuffy nose. Three different types — steroid nasal sprays, decongestants, and saline nasal sprays — can come in two types of containers; pump bottles and pressurized containers, but not all nasal sprays work for all situations. How should you use nasal sprays, and what type is right for you? Decongestants are sold over-the-counter or with a doctor's prescription. They send your nasal congestion packing by shrinking the blood vessels within the lining of your nose, in turn decreasing inflammation. Decongestants should only be used for a short time — no longer than three days, twice a day. If you ignore this advice and use decongestant sprays longer, your symptoms won’t get better but worse because of a phenomenon called the “rebound effect”. Using a nasal spray more than you should or for a longer period of time has the potential to cause a vicious cycle; your congestion will be worse than before and you’ll want to more and nasal spray to make up for it, making your congestion even worse, and so on. If you do suffer from rebound congestion there is only one way to stop it and that is to quit using nasal spray altogether. As long as you use them responsibly, though, nasal spray decongestants can make breathing easier and also fight inflammation. Oral decongestants might cause you to be nervous or make your heart to beat very fast, but the nasal sprays don’t have as many side effects since they go right into your nose. You might have tried oral medications when suffering from nasal congestion caused by a flu, cold, or some different upper respiratory infection but if oral medication isn't working out, you could try nasal spray decongestants. Get in touch with your physician if you’re not sure whether you should take decongestants. Make sure to get in touch with your physician if you keep experiencing side effects, and ask your doctor before using nasal decongestants if you have heart disease, high blood pressure, thyroid disease, diabetes, or enlarged prostate gland. Saline nasal sprays can be bought over the counter, and work by loosening your mucus as well as helping it not be crusty. The good thing about saline nasal sprays is that they don’t contain any drugs, so you can use them for however long you want to. Research suggests that a saline mixture can return moisture to dry sinuses and nasal passages. The saline mixture is also proven to reduce inflammation of the mucus membranes. You could try a mini squirt bottle for saline irrigation, as this can help thin your mucus and lessen postnasal drip, as well as wash the bacteria in your nose out. A lot of the OTC saline nasal sprays are isotonic — this means that the mixture is the same as the saline concentration inside your body. The hypertonic types include a bigger concentration of salt compared to what is in your body. The hypertonic and the isotonic kind can both clear your mucus. Another thing that saline spray does is keep the cilia inside your nose healthy. These are tiny structures that are like hairs and they can help humidify the air that goes to the lungs, as well as catching bacteria so they don’t go into the cells, and they play a role in your sense of smell. This means saline sprays could be a treatment for sinusitis and rhinitis because they keep cilia healthy. It’s pretty simple to make your very own saline solution to clean your sinuses and nose. You can make your own saline mixture with a Neti pot, a bulb syringe, a plastic squirt bottle, or just your hands. First of all, combine three teaspoons of non-iodized salt (kosher salt that has no additives works the best) and a teaspoon of baking soda. Keep this solution safe in a little jar (make sure it is clean). Now you can simply use it by adding a teaspoon of this solution and mixing it into eight ounces of sterile, distilled, or boiled earlier cold water. Steroid nasal sprays (corticosteroid nasal sprays) are anti-inflammatory drugs which your spray into your nose. You can get some steroid nasal sprays over-the-counter, while others are prescription-only. You can also buy steroid nasal drops. They are meant to ease allergy symptoms like non-allergic rhinitis, nasal polyps, and hay fever. However, they can also help you with a stuffy nose from a sinus infection. Some frequently used steroid nasal sprays are mometasone, beclometasone, fluticasone, and budesonide. They are an artificial form of hormones which are usually made within the adrenal glands — two little glands above your kidneys. After they are sprayed in your nose they work by lessening inflammation. This can ease symptoms like a blocked or a runny nose or sneezing, as well as lessening the size of all types of swellings (like polyps) inside your nose. Can Afrin nose spray cause nausea and dizziness? Wish me luck! Afrin be GONE!! !